BMW Track Trainer is a modified BMW 330i that can negotiate a race track autonomously at the limit of traction. It was conceived as a driver training tool that allows a new student to experience the ideal race line from the driver's seat. 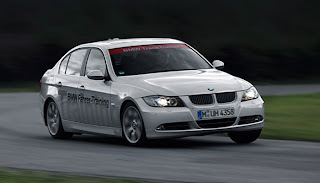 The vehicle is a research project from BMW Group Research and Technology (BMW Forschung und Technik GmbH). Track Trainer has raced autonomously at Valencia, Hockenheimring, Lausitzring, Zandvoort, Nordschleife and Laguna Seca. Track Trainer was covered by Top Gear (2002 TV Series) in a segment during the 2007 season and The Car Show on the third episode of the 2011 season. Track Trainer uses a combination of GPS and INS data to create a precision position estimate of the vehicle states in real-time. Vehicle control is commanded to an ideal line recorded by a manually driven reference lap. Last updated on 8 February 2013 at 18:11.